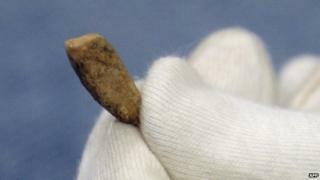 A human tooth dating to around 565,000 years ago has been found by a 16-year-old volunteer in France. The tooth was found at Arago cave near the village of Tautavel, one of the world's most important prehistoric sites; it has been under excavation for about 50 years. The owner of the tooth - a very worn lower incisor - lived during a cold and dry period, according to scientists. They hunted horses, reindeer, bison and rhinoceros. "A large adult tooth - we can't say if it was from a male or female - was found during excavations of soil we know to be between 550,000 and 580,000 years old, because we used different dating methods," paleoanthropologist Amelie Viallet told the AFP news agency. "This is a major discovery because we have very few human fossils from this period in Europe," she said. They were among hundreds of young trainee archaeologists who come to work in the cave every year to study human ancestors during Lower Palaeolithic times. Older fossils are known from western Europe: remains thought to belong to the species Homo antecessor from Spain are estimated to be 1.2 million years old.